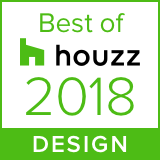 Ashley Roi Jenkins Design offers award-winning interior design services in the San Francisco Bay area, specializing in luxurious timeless design. We focus on building a strong partnership with our clients to fulfill their vision of transforming their business. Below is a small sample of our extensive portfolio. In 2013 ARJ Design was approached by Martinkovic Milford AIA to help design the new offices of the thriving Golden Gate OBGYN + Skin Center medical practice. The best designs come out of such collaborations and end up with award winning results. The 7,500 sq. ft. renovation and re-design of a historic brick and mortar building, which processed the import and sale of wheat in the early 20th century, ensued. The clients desire was to create something a bit more luxurious than your average medical practice. Something more like a modern and elegant boutique hotel that would support an established brand and incorporate the new skin centers spa services. The original safe would be retained, and was used as our design starting point. Colors like orange, sky blue, browns, and creams warmed up the brick and plaster interior. Custom millwork added to the bevy of innovative materials like 3Form , and eco friendly plaster and paint treatments. An original chandelier from RollandHill by Jason Miller was used in the entry way above the check-in desk to greet the clients. After years of going to see Sophia at a local San Francisco salon and discussing her dream of launching her own business one day, the phone rang and Sophia said, "We finally found the space, it's about 2,000 sq. ft., when are you available?" A stylish and elegant interior is what we needed to develop for this Beauty Lounge. A reflection of the clientele, owner, and emerging brand. It had to be modern and exude luxury, to stand out amongst the crowd of salons and support the natural and fresh products and services which are provided there. 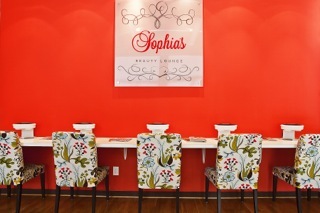 Sophia also wanted to use red, the color of strength and prosperity, from her native country, unlike most Spa's and Lounges which opt for soft child like colors. Since the natural light was extremely bright and over heating in the space could be an issue, we chose a warm brown to dampen the light reflection and add an earth element from Benjamin Moore. Bleached oak floors subtly enhance a feeling of floating when you enter the contemporary, two story high ceiling space, which subconsciously sends the client into a state of relaxation. Mid-century inspired modern furniture was used to support the clean lines of the architecture with a small feminine twist of a danish floral and fauna print, which also brought in our complimentary color palate. The pedicure chairs and stools were found at Ikea. A brown and white chevron was added for it's modern and dynamic feeling. Wispy window coverings in the primary treatment room was added soften the interior. Table design sponsored by Water Works plumbing for the fund raiser Design Industry Fighting Aids, a.k.a. DIFFA. A Winter Wonderland picnic was erected to fund the continued visionary Aids research which takes place at the University of California San Francisco Medical Center. Event co-sponsored by Champagne Taittinger. Event and table featured in Elle Decor.